Annie Athyal (center), a case manager, spoke at a group session. When the photo of a young Syrian boy’s body washed up on a Turkish beach was released in 2015, it quickly became a symbol of the refugee crisis and the difficult journeys people were making to escape unrest in their home countries. The photo kept Medford resident Robert Fowkes up at night for weeks. With more attention than ever on the crisis and issues of immigration, Fowkes knew what he needed to do was to effect direct change. Fowkes and his wife joined ArCS Cluster, a group of volunteers helping refugees and asylum seekers in Arlington, Cambridge, and Somerville. 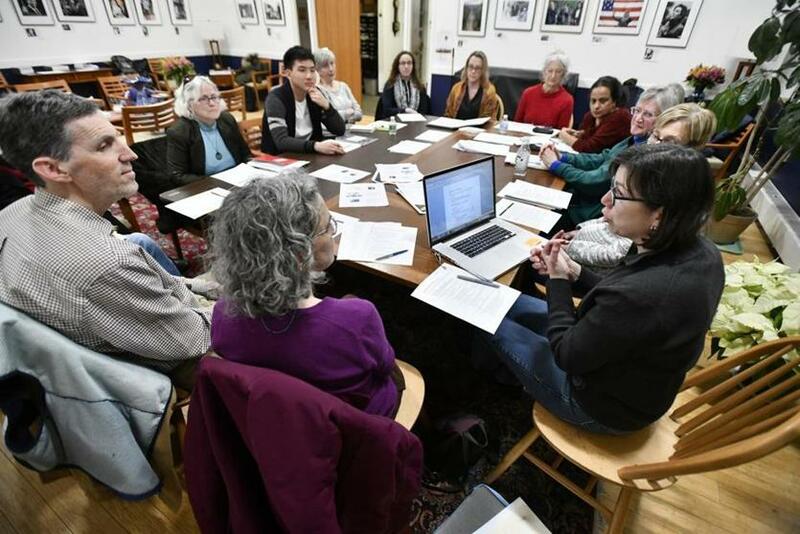 The group started in the spring of 2016 as an arm of the Malden-based nonprofit Refugee Immigration Ministry, with a mission of helping through person-to-person connection. Asylum seekers come to the United States to escape issues such as war, persecution, or domestic violence. Once here, they must apply for asylum and then wait at least five months to apply for a work permit. While they wait to be approved, individuals can lack access to medical care and face housing insecurity and social barriers that make the process even more difficult. The group attempts to make the transition as smooth as possible. “Our first goal is independence,” said Eric Segal, founder and co-coordinator of the cluster. “We do what we can to support our guests and give them the tools to be successful on their own. The cluster, which has over 250 members with roughly 50 active volunteers, provides services to asylum seekers from countries including Saudi Arabia, Libya, Liberia, and Rwanda. It is the first explicitly LGBT-friendly cluster in the Refugee Immigration Ministry. Although the cluster was formed out of First Parish Unitarian Universalist of Arlington, all volunteers are welcome whether or not they are affiliated with any religious organization. Asylum seekers are assigned a team of people to help them. Teams are coordinated by a point person who has direct contact with the guest. Other volunteers serve as drivers, offer housing, and help with special projects such as collecting donations or organizing local ESL, medical, and vocational resources. The group provides clothing, food, MBTA passes, and cellphones, among other things. “We have teams working vertically to support the guests, but we also work across and within the cluster to provide support. One volunteer might create a list of local food banks and that becomes a resource for each team,” said Sarah Trilling, co-coordinator. For many of the volunteers, the connections made with asylum seekers are long-lasting. The cluster strategizes about how best to assist the asylum seekers it serves. At one group meeting, the volunteers planned to put together a list of local dental care providers in the event that a guest needs care. They also discussed changes in laws regarding asylum seekers that may affect the work authorization process. “We wish we could get these guests everything they need and move quickly while doing it, but people are involved, so it means careful planning,” said Elaine Crowder, who serves as a point person. The cluster helps the asylum seekers in seemingly small ways as well. After finding out that one of their guests was uncomfortable taking the bus late at night, volunteers took turns driving her home from appointments. Fowkes and his wife, who live in Medford, have been members of First Parish for more than 20 years. He recently retired and felt he had more time to invest in charity work. The experience of housing an asylum seeker has also had a positive impact on him. The couple took in an asylum seeker who had been living on the street. The guest has been living with the pair for more than a year now. The three have dinner together every night, and the couple has introduced him to his family and friends. Fowkes said they have formed a deep connection. Previously, the cluster focused on refugees who needed housing, but organizers have found that many asylum seekers are in greater need of other necessities such as education, food, clothing, and health care. They will expand their reach by creating a Passages program, which will focus on providing services to refugees who already have housing. Cluster volunteers see the work they do as a benefit to the communities they serve as well. For more information about ArCS Cluster, visit arcscluster.org. 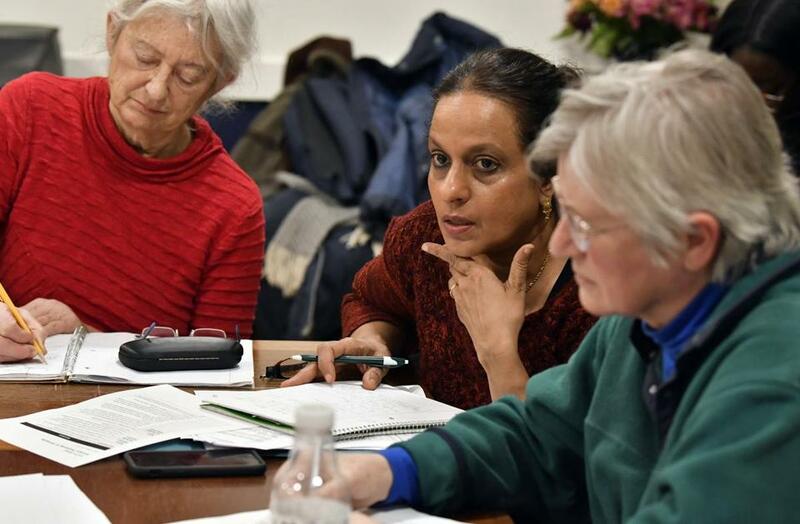 Co-coordinator Carolyn Hodges (right) spoke at an ArCS coordinating committee meeting held to discuss the group’s work in finding housing and employment opportunities for asylum seekers in Arlington, Cambridge, and Somerville. To her left sat co-coordinators Eric Segal and Sarah Trilling.